President Trump is on a 9 day trip to Saudi Arabia, Israel, the Vatican and Brussels. He traveled to Riyadh on Saturday and Sunday spoke to 55 leaders from Muslim-majority countries. In place of a news report on the speech, read the President’s actual speech and answer the questions. 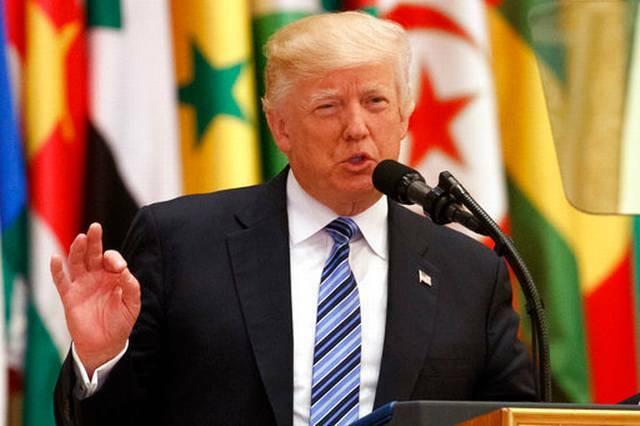 President Donald Trump delivers a speech to the Arab Islamic American Summit, May 21, 2017, in Riyadh, Saudi Arabia. For Americans, this is an exciting time. A new spirit of optimism is sweeping our country: in just a few months, we have created almost a million new jobs, added over 3 trillion dollars of new value, lifted the burdens on American industry, and made record investments in our military that will protect the safety of our people and enhance the security of our wonderful friends and allies—many of whom are here today. America is a sovereign nation and our first priority is always the safety and security of our citizens. We are not here to lecture—we are not here to tell other people how to live, what to do, who to be, or how to worship. Instead, we are here to offer partnership—based on shared interests and values—to pursue a better future for us all. With God’s help, this summit will mark the beginning of the end for those who practice terror and spread its vile creed. At the same time, we pray this special gathering may someday be remembered as the beginning of peace in the Middle East—and maybe, even all over the world. When we see the scenes of destruction in the wake of terror, we see no signs that those murdered were Jewish or Christian, Shia or Sunni. When we look upon the streams of innocent blood soaked into the ancient ground, we cannot see the faith or sect or tribe of the victims—we see only that they were Children of God whose deaths are an insult to all that is holy. In that spirit, after concluding my visit in Riyadh, I will travel to Jerusalem and Bethlehem, and then to the Vatican—visiting many of the holiest places in the three Abrahamic Faiths. If these three faiths can join together in cooperation, then peace in this world is possible – including peace between Israelis and Palestinians. I will be meeting with both Israeli Prime Minister Benjamin Netanyahu and Palestinian President Mahmoud Abbas.